Extreame Savings Item! Free Shipping Included! Save 41% on the Massive Audio GTX122 12in Subwoofer - GTX Series 1400 Watt Subwoofer that Works Great as Competition Subwoofer! Dual 2 Ohm, 2.5 inch Voice Coil. Sold Individually. by MASSIVE at Got Busted Mobile. MPN: GTX122. Hurry! Limited time offer. Offer valid only while supplies last. DETAILS All four GTX Series subwoofers are rated at 700 watts RMS / 1400 watts MAX power with a 2.5'' voice coil configured for dual 4 ohm impedance. BEST CAR SUBWOOFER IN THE MARKET | Our Massive Subwoofer produce great sound built for competition! Our CEA 2031 Certified Subwoofer is rated at 700 watts RMS / 1400 watts MAX power with a 2.5" voice coil configured for dual 2 ohm impedance. Our Massive Subwoofer is used by countless high end Car Audio enthusiasts for big sound and high scores that toss the competition out of the ring! 12 INCH SUBWOOFER WITH GREAT SOUND QUALITY | With an amazing deep base, it is truly the best sounding Bass Subwoofer in the market! The sound that comes out of this 12 inch Subwoofer Speaker will improve the sound quality of your car audio system! It's bonded to a heavy gauge steel basket that's bolted to double stacked high flux Y30 120oz Strontium ferrite magnets with a 10mm top plate, producing great sound that lasts longer than your factory subwoofers and other more expensive brands! TURN UP THE VOLUME! OUR CAR SUBWOOFER IS GUARANTEED TO LAST! | Don't take the risk of buying Car Subwoofer Speakers that Snaps, Crackles, and Pops after short use due to Cones and Rubber that are as soft as butter. Our Fully Loaded Subwoofer is guaranteed not to rattle in any high volume! Great Sound dances on a springy poly cotton spider with high powered woven tinsel leads that connect to spring loaded 5-way binding nickel plated speaker connectors! 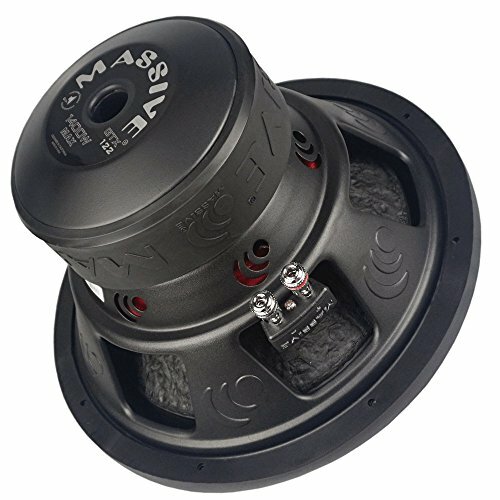 THE ONLY CAR AUDIO SUBWOOFER YOU WILL EVER NEED | Are you frustrated with those poor quality car subwoofers from other brands that blow out over time? With our high quality construction, great sound and long lasting performance, our Car Subwoofer is all you will ever need! Its perfect as Ford f150 Subwoofers, f150 Supercrew Subwoofer, f250 Subwoofer, Dodge Ram 1500 subwoofer, Toyota Tacoma Subwoofer, Jeep Subwoofer, GMC Sierra Subwoofer, Dodge Ram Subwoofer, Crew Cab Subwoofer, and others! MASSIVE AUDIO QUALITY GUARANTEED | Since 1999, Massive Audio has been an industry leader in high performance audio products. Massive Audio laid its roots in high quality audio reproduction through in-house engineering and a dedication to customers. Compare us to other brands like Bose, Boss, Rockford Fosgate, Alpine, JBL, and hear the MASSIVE difference! If you have any questions about this product by MASSIVE, contact us by completing and submitting the form below. If you are looking for a specif part number, please include it with your message.